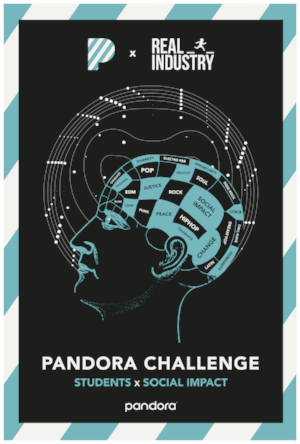 Earlier this fall, we partnered with the non-profit Real Industry for the second annual Pandora Challenge: Music and Social Impact program at five universities across the country. Over 500 students leveraged AMP to harness the power of music, engage fans, support musicians, and launch major social impact campaigns. Keep reading to learn more about what students at each school accomplished! On September 13, the Pandora Challenge kicked off at the University of Miami in collaboration with chart-topping recording artist Phora. Participating students created a national music marketing and playlist campaign to advocate for mental health awareness. In partnership with The Late Show with Stephen Colbert bandleader Jon Batiste, the next challenge was held at Carnegie Mellon University on September 17 to promote Sing For Hope and its mission to transform individuals and communities by leveraging the power of the arts to create a better world. The University of Michigan challenge launched on September 25 with breakout artist Bryce Vine and the non-profit Barn Sanctuary in support of their mission to rescue, rehabilitate and care for farm animal refugees. On September 26, students in New York University Steinhardt’s Department of Music and Performing Arts Professions curated playlists, showcasing the music and introductory messages from Grammy-winning rock band The War on Drugs. Students analyzed The War on Drugs analytics, audience and fan engagement data, and worked with top industry mentors to craft mixtapes that support the GRAMMY Music Education Coalition.